When Nik Software first released Viveza in 2008, it opened a new way of making complex adjustments based on color and light with the use of U Point technology that had previously been available only in Nikon Capture NX. Rather than making difficult selections and masks, the U Point couple be placed on the area you wanted to adjust, and Viveza would handle all the hard work for you with very natural results. Since that time, Nik has added UPoint functionality to their other plug-ins and the technology has proven itself to be very useful, and make what would normally be very time consuming adjustments much easier and faster. Recently, Nik released Viveza 2.0 with a number of new features, while retaining the same ease of use as the original version. In this review, I'll take a look at version 2 and see if it's worth the upgrade for existing owners, or a second look if you're not a Viveza user yet. 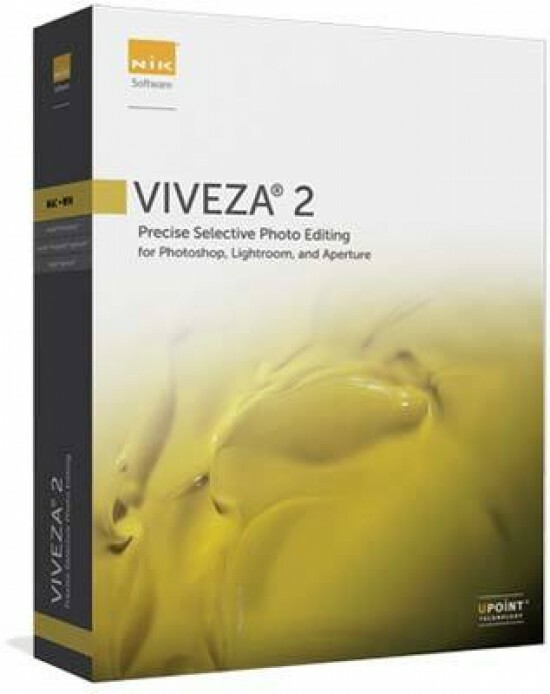 At it's most basic, Viveza is a plug-in for Photoshop, Lightroom, or Aperture that makes it possible to make adjustments to color and light in your digital images. 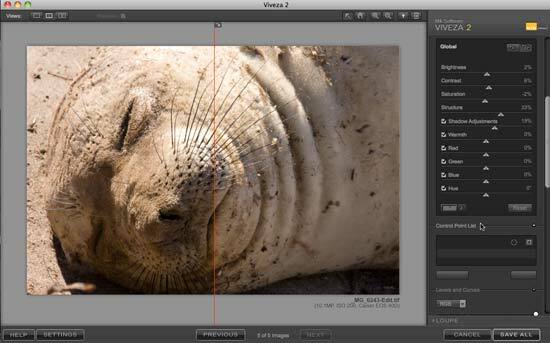 Rather than having to paint adjustments on via adjustment layers in Photoshop, and making masks, Viveza works by placing a U Point on your image. 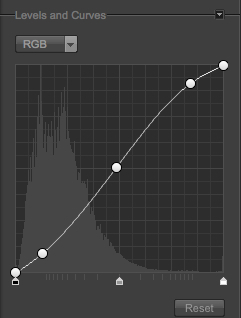 This U Point affects the color and light values that are confined to the specific values that you want. You can control the size of the adjustment area to be as small or as large as you like, and then make various changes to hue, saturation, brightness, contrast, and individual color channels among other areas. 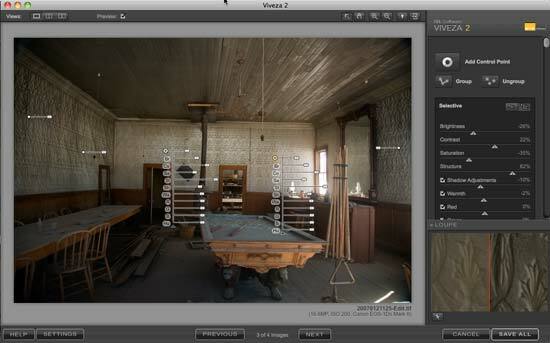 New to Viveza 2 is the ability to place multiple control points on your image and group them together. A very powerful addition, you can now use more control points, group them, and ensure that all your adjustments will remain in sync. Of course, if you change your mind, you can always ungroup the control points and adjust them individually. Along with the controls offered in version 1, Viveza 2 adds global adjustments that require no control points to be placed on your image, giving you a more streamlined workflow – you now need to do less work in your editing application before going into Viveza, or if you've already made adjustments, you can fine tune them while still in the plug-in. Also new is a levels and curves adjustment, improved color rendering and enhancements to the user interface that make the plug-in easier to use. Two new adjustments add a great deal of power to the plug-in. Shadow Recovery, which can be done either globally or with a control point, does an excellent job of pulling detail out of dense shadow areas without introducing noise. The Structure adjustment is based on the same function in Nik Sharpener Pro and does an excellent job of enhancing details in your image without adding artifacts or giving your edges a processed look. When you install Viveza 2, you'll get the versions that match your system. If you have Lightroom or Aperture installed in addition to Photoshop, those versions will also be installed. Viveza 2 includes 64-bit support, so Windows users of 64bit Photoshop CS4 will be happy to find that Viveza works with this version. To get started, open your image in Photoshop, or in Lightroom and Aperture, select one or more images and then select the Viveza plug-in (with both Lightroom and Aperture, selecting multiple images adds a previous and next button to move between images). 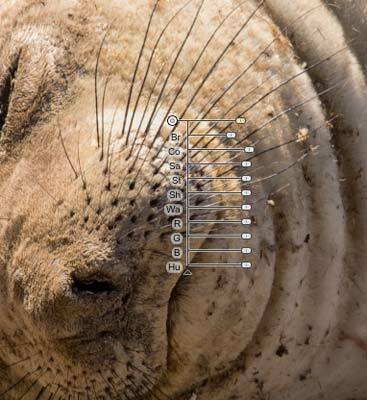 For a basic adjustment, I'm going to work with this sea lion image. The original has some highlight issues and could use a bump in contrast and structure. In Viveza 2, I can start with a global adjustment to the structure, as well as open up the shadows a little more. From this point, I'll add a control point on one of the brightest areas and pull down the brightness, giving the image a more balanced look with enhanced details.